Originally published in the Los Angeles Loyolan and co-written with Allison Croley. For original, please refer to: Caserio to assume role of ASLMU president – Los Angeles Loyolan. As senior marketing major Bryan Ruiz’s era as ASLMU president ends, the LMU student body will have to look to former ASLMU Vice President and senior sociology major Vinnie Caserio, the new ASLMU president, as ASLMU pushes forward. 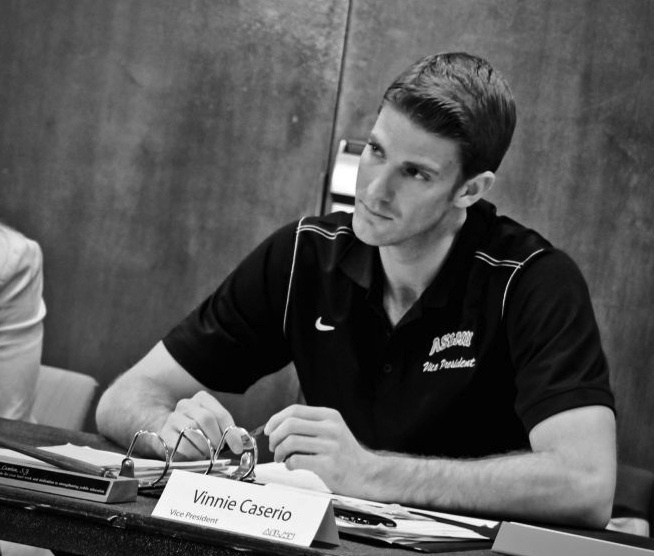 One of Caserio’s first tasks will be to refocus ASLMU as the voice of LMU’s student body. The impeachment complaint and subsequent unrelated removal of Ruiz has brought dispute not only between members of the organizations involved, but between other students as well. Status updates on both the ASLMU and Loyolan Facebook pages quickly filled with comments ranging from students arguing the validity of the impeachment complaint to whether the University should have removed Ruiz. Senior political science major Sarah Palacios, ASLMU’s attorney general, told the Loyolan that Caserio’s ability to bring students together will be vital during this period of transition. “Vinnie was elected for a reason. He has this strength to unite people. It’s unparalleled,” she said. Caserio’s time to unite is short, however. According to the ASLMU website, campaigns for the 2013-14 election are already undergoing approval, and platforms will be posted this Thursday, Feb. 28. Elections will be held from March 19-21, and results will be posted at 8 p.m. on Thursday, March 21. Though the ASLMU president and vice president don’t officially transition until commencement, according to Director of SLD Andrea Niemi, this still only leaves Caserio with a few weeks before elections to seize the spotlight. Still, according to Assistant Director of SLD and ASLMU Adviser Alexandra Froehlich, Caserio will make the most of the time he has. “One thing I’ve learned about Vinnie this entire year is that he will step up to the plate and try everything,” Froelich said. The spring semester of ASLMU’s schedule is notable for March’s Collegefest, the annual spring concert that has in the past brought acts like The Bravery and Gym Class Heroes to LMU. Though ASLMU may be transitioning leaders as Collegefest rapidly approaches, Froehlich said she has faith the planning would proceed properly.